The vials coming from sterilizing tunnel will be sent to conveying belt through the turntable, sent to the transition star-wheel through conveying belt and sent to filling star-wheel through transition star-wheel for positioning filling, filling star-wheel locate vials at filling nozzle, filling auger begins to work, fill powder directly into vials. After filling, vials are sent to stoppering station. During stoppering station, the vials are sent to the rotary stoppering plate, the stoppers are sucked by the vacuum, and move with the stoppering plates, the vials moves up and then they are plugged with stoppers one by one. After stoppering, the vials will be sent out to the collecting tray through the star-wheel. Up to now, then whole filling and stoppering process are completed. Dia. of the turntable: 1200mm, Way of outfeed: Single row outfeed, Material of machine frame: SS 304. There is transition board at exit of tunnel to connect with turntable. Vials are sent to the infeed star-wheel one by one. There is a controllable buffer area at the inputting part of turntable, and control system for detection of vial crowding in turntable, to control vial quantity in this area. When it exceeds set point, vial crowding control system will send instruction to stop the washing machine and mesh belt of tunnel. It realizes linkage running of the whole line, and it is good for coordination of the compact line. It adopts P+F photoelectric fiber switch to realize no-vial-no-filling, which has high control precision and low error action rate, and avoids medicine powder waste. At filling station, the vials are sent to filling star-wheel through turntable and conveyor belt. The odd number vials are filled at first filling station, the even number vials are filled at second filling station, then all of the filled vials are sent to stopping station through the transition star-wheel. It adopts the positioning filling structure, the powder is feed into the vial through the auger, with very short time exposure of the powder, and also avoids the second contamination for the powder. It can meet the FDA and EU CGMP standard. It adopts big auger powder supply structure from supply port to filling chamber, to control powder quantity in the chamber, guarantees filling precision. It adopts stepper motor to drive the big auger. It has mixing device in filling chamber, guarantees uniform distribution of powder, avoids blocking phenomena. Mixing device adopts stepper motor to drive. It adopts servo motor to control filling auger for filling quantity. Because servo motor adopts closed ring movement, which avoids loosing step phenomena in high speed running, improves filling precision. And it only need to adjust filling quantity in touch screen, no need for manual adjustment. Adjusted parameters can be saved for future use(can store several groups of parameters).. It adopts the butterfly valve to connect the powder turnover bucket and powder distribution bucket, which prevent the powder exposure, guarantees the cleanness requirement. 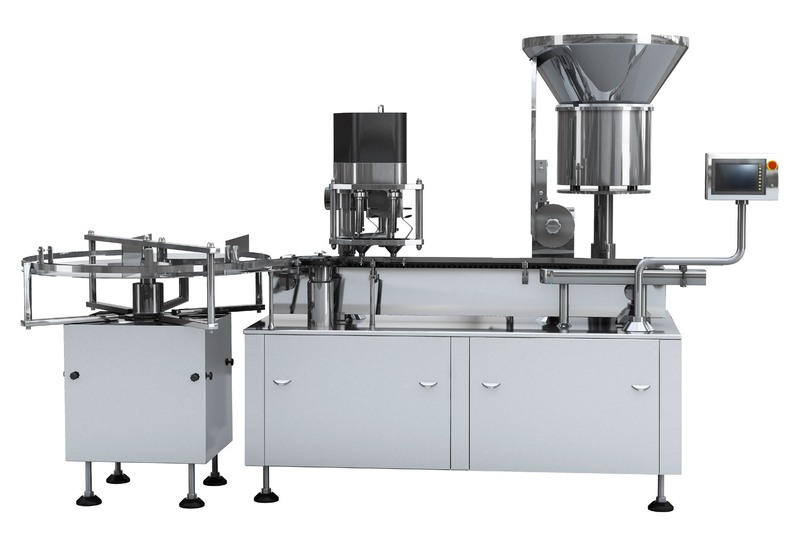 The filling system is fit for 1g filling volume, for exceeding filling range buyer need to add filling auger to achieve. During stoppering station, the vials are sent to the rotary stoppering plate, the stoppers are sucked by the vacuum, and move with the stoppering plates, the vials moves up and then they are plugged with stoppers one by one. The vacuum source is supplied by the buyer. It adopts integral stoppering, which is convenient for size changing, cleaning and sterilizing. It adopts advanced rotary stopper taking and linear stoppering method, in favor of smooth, stable stoppering and without fallen vial. It increases no-vial-no-stoppering control device between stopper hopper and stopper suction plate. When there is no vial, the PLC will send order, the electromagnet in no-vial-no-stoppering control device will work, it will block stopper channel, to realize no-vial-no-stoppering function. Adjusting oscillation voltage can control stopper orienting speed. Stopper output position also can be adjusted up and down. It is easy to operate, and works stably. It adopts star-wheel outfeeding, single outfeed path. Vial infeed part, filling part, stopper feeding part, stoppering part are under Class 100 LAF, which is equipped with stainless steel frame and polymethyl methacrylate safety door with interlock. LAF system is supplied by buyer. Interlocking device: interlocking with other machines to show the causes of fault, position of fault and simple solution. Metal material contacting with medical powder such as auger adopt 316L. All size parts without metal material such as star-wheels adopt POM (polyformaldehyde) material. Frame of filter, LAF fan, HEPA filter (H14), differential pressure gauge, DEHS/PAO port. Safety door of polymethyl methacrylate, self-control interlocks, stop when opened.